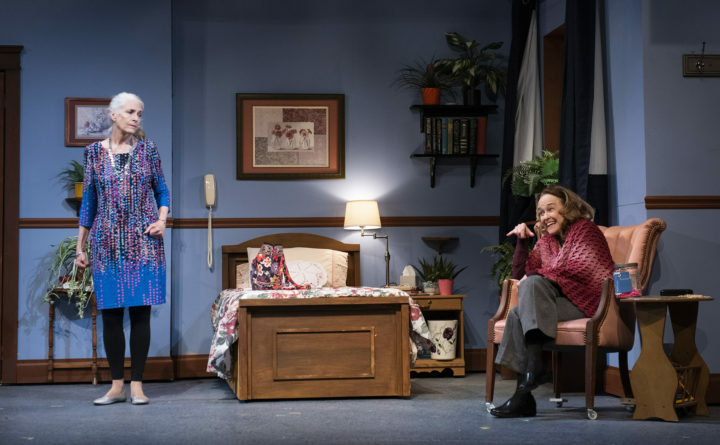 Sara Morsey (left) and Danielle Kennedy star in "Ripcord" at the Penobscot Theatre Co. this month. A defective prop marred the opening night production of the Penobscot Theatre Co.’s latest offering when what is suspected to be pepper spray filled the Bangor Opera House and caused theatergoers to suffer coughing fits. It happened about 6:15 p.m. during a scene toward the beginning of Act Two of David Lindsay-Abaire’s comedy “Ripcord.” During a confrontation, actress Danielle Kennedy pulled a small container from her purse and sprayed it in the eyes of actor Brad LaBree, who did not appear to break character. As the mist dissipated over the audience, people began coughing uncontrollably. So many theatergoers were coughing that dialogue could not be heard for most of the next scene. Some audience members coughed through the curtain call. Members of the Bangor fire and police departments were at the theater to investigate as the performance ended. Producing Artistic Director Bari Newport on Sunday issued an apology and an explanation for what happened. “The item that was used onstage was labeled as water typically used as a training product for law enforcement and other safety training scenarios,” she said. “Despite several other performances that used identical canisters that went off without incident, the canister used last night was clearly mislabeled. Newport offered people who attended Saturday’s performance an opportunity to see the show again for free or credit for a different show later in the season. During subsequent performances, a different prop will be used, she said. Kathryn Ravenscraft, director of Development and Communications, said Sunday that one cast member was “still experiencing some discomfort” but said the actor did not want to be identified. “Ripcord” will be performed through March 31.